"Things we Like: Culture's Impact on Preference," Specialty Coffee Association Symposium Youtube. Deutschlandfunk Radio Show, "The Power of the Burger." This radio piece was aired by Deutschlandfunk (a culture-focused German Radio station) titled Gastronomic Culture / Food Culture US. 2014. “Imperfection Salad,” short film in the Lunch Love Community Documentary Project. Through a mosaic of twelve interconnecting short documentaries, Lunch Love Community explores food and education, children and health, and citizens making democratic change. Written, produced and directed by Helen De Michiel. Co-producer and Director of Photography, Sophie Constantino. Thirty Leaves Production & Citizen Film, in association with Media Working Group, DVD (2014). What does 'eating right' really mean? Food Blog Food news from UC Agriculture and Natural Resources. 6 November 2013. 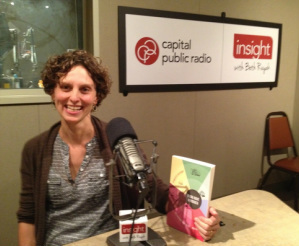 “Rethinking Science Communication,” Addressing Public Perceptions of Modern Agriculture, UC Davis. August 6, 2018. 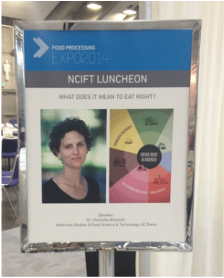 “Design Thinking for the Creative Food Scientist,” IFTNEXT Workshop, Institute for Food Technologists. July 15, 2018. “Sensing Natural Food,” Association for the Study of Food and Society. June 2018. “Empathetic Innovation,” Association for the Study of Food and Society. June 2018. “What Should Natural Mean? Exploring the FDA docket on Natural Claims,” Department of Food Science and Technology Research Symposium, UC Davis. December 12, 2017. “The (In)Sensibilities of Regulating the Natural: Reading the FDA Docket,” Society for the Social Studies of Science. September 2017. "Design Thinking for Food,” IFT Next Stage, Institute of Food Technologists. June 2017. “Regulating Natures: Reading the FDA Docket on Natural Claims,” Association for the Study of Food and Society. June 2017. “Design Thinking for Food (Science),” Association for the Study of Food and Society. June 2017. "Food Studies at the Crossroads: Speaking Culture to Science & Industry," Food Studies at Brown Speaker Series. May 6, 2017. “What Can STS offer Food Studies?,” Association for the Study of Food and Society. June 2016. "What Makes Food Good?" University of Vermont Food Systems Summit, keynote lecture. June 14–15, 2016. "Product Development & Food Technology: From Concept to Product" with Matthew Lange. Specialty Coffee Association Sensory Summit. January 2016. Fast-pitch Research Presentation at the Food, Ag, and Health Solution Summit, UC Davis World Food Center. December 2015. 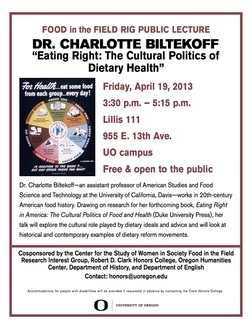 “The Cultural Politics of 'Good Food,'” California Department of Food and Agriculture, Sacramento, CA. November 2015. "Real Facts Vs. Real Food: Framing Contests over the Meaning and Value of Processed Food." Trusting the Hand that Feeds You conference, Brussels, Belgium. September 7, 2015. American Food Culture and the Contradictory National Dialogues on Food," Institute of Food Technologists annual meeting, Chicago, IL. June 11-14, 2015. "Green Smoothies, Big Gulps and the Cultural Politics of ‘Good Food’ Institute for Social Science Research Conference, UC Davis. April 24, 2015. "Listening to Culture - Consumer-Facing Product Development" Viticulture & Enology/Food Science &Technology Symposium Vision for the Future. UC Davis. April 11, 2015. "Things We Like: Culture's Impact on Preference" Specialty Coffee Association of America (SCAA) Symposium. Seattle, WA. April 8-9, 2015. Food Leaders Summit, "Navigating Consumer Desires in an Era of Too Much Information" Chicago, IL. April 27-29, 2015. Read the Speaker Spotlight interview with Charlotte. "Watching Mold Grow: Facts, Politics, and 'Processed Food' Lesson Plans" Sustainable Consumption Institute, in conjunction with Gastronomica. University of Manchester. February 17, 2015. "Eating Right in America: Dietary Ideals as Social Ideals" Keynote address at the Annual Meeting of the Historians in the German Association of American Studies. Erfurt University. 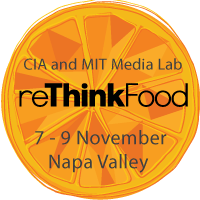 February 13-15, 2015.
reThink Food Conference, Culinary Institute of America and MIT Media Project, November 7-9 2014, Napa Valley, CA. Presentation, "ReThinking Moldy Bread: Science, Politics and Processed Food" ; Panel Participant, “Incubating Innovation: Food Entrepreneurs from Garage Start-Ups to Academia and Boardrooms." Lunch Love Community Documentary Project , Media Social (screening and panel discussion), Wednesday May 7, 7-9pm, David Brower Center, Berkeley CA. Click here for details. 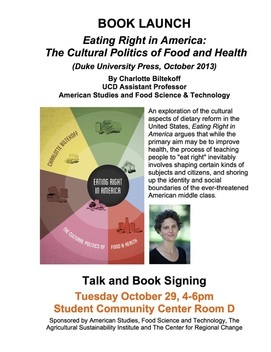 ​"Charlotte Biltekoff on Transparency, Dietary Reform & the Future of Food," Q&A with Hailey Grohman. UVM Food Feed. May 2016. "The promise of Transparency"﻿ Food Fatness and Fitness: Critical Perspectives. November 2013. "Eat Right Here: The Cultural Politics of Ethical Eating," Utne Reader. December 2013. Watch Charlotte discuss the key ideas of Eating Right in America in the short documentary film "Imperfection Salad."